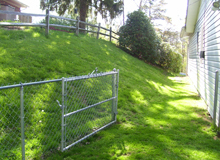 Goals: The Richeys were experiencing water issues in their basement due to this bank which sloped towards the north side of their home. 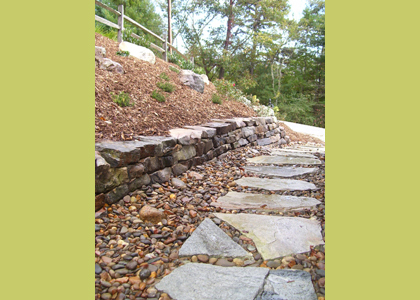 They asked Mantis Gardens to rectify the water issues while creating a level and dry pathway to the back yard. Challenges: Finding the right size piece of equipment that was large enough to be effective in excavating the French drain yet small enough to fit in between the bank and the house. 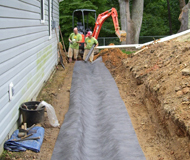 Results: We built a French drain which quickly moves water away from the house. 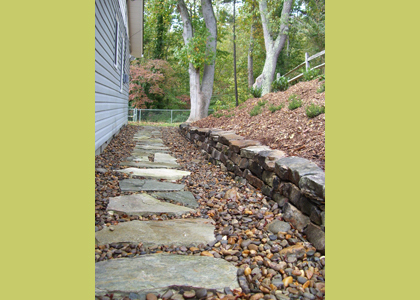 Above the French drain we laid a chocolate flagstone walking path flanked by river cobble and a Tennessee field stone dry stacked retaining wall.